The CEEMC has always had a strong link with the Faculty of Law and the Centre for European Legal Studies of the Law Faculty, University of Cambridge, in particular a number of former CELS Directors including Prof W. R. Cornish, Prof. Catherine Barnard, Dr Nathalie Prouvez and Dr Angela Ward and the former faculty chairman Prof. Richard Fentiman. The British Law Centre (britishlawcentre.co.uk) founded the Central and Eastern European Moot Court competition in 1994 to enable teams of law students to develop mooting and presentational skills in a simulated EU court forum where they are judged by EU experts. The CEEMC is organised in co-operation with local hosts in each of our annual venues. 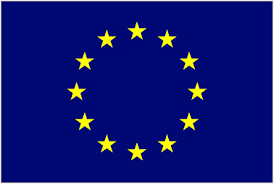 In 2019 our co-organiser will be the Court of Justice of the European Union. Each year the winning team’s prize includes a visit to the Faculty of Law, University of Cambridge, residing in a Cambridge College, attending introductory lectures, using the library and other facilities together with a visit to the Courts of Justice in London. 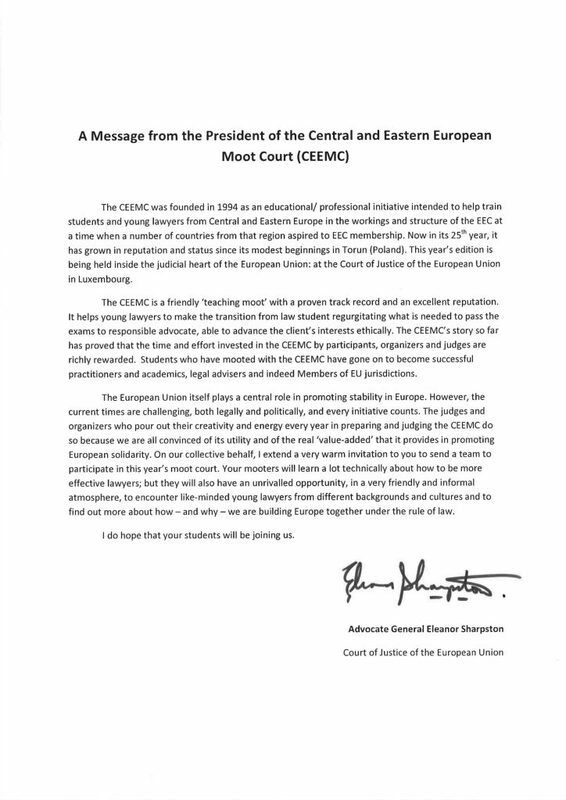 Essential to the success of the competition has always been the healthy collaboration with members of the institutions, in particular we are fortunate that over the years the President of the CEEMC Judicial Panel has always been a member or former member of the European Court of Justice: Lord Slynn of Hadley, AG Fennelly, AG Sharpston. The prize of best speaker has entitled its holder to visit the Court of Justice, formerly the chambers of AG Francis Jacobs, currently in the chambers of the UK Advocate General, Eleanor Sharpston or Bulgarian Judge, Alexander Arabadjiev. In addition members of the cabinets of the UK Advocate General, Czech Advocate General, Bulgarian and Czech and Polish General court judges, as well as of EFTA Surveillance Authority have assisted as part of the drafting committee. CLIFFORD CHANCE solicitors (through its CEE local offices) has been the main sponsors of the competition for over 15. Many former competitors have taken up the opportunity of then doing work experience with Clifford Chance and as a result offered full time employment in offices in the region. The Inner Temple is one of the four Inns of Court, which play a central role in the education, training and continuing professional development of the barristers’ legal profession in England and Wales. Barristers have the primary right of audience in the English courts and the majority of judges are appointed from this profession. Advocacy training is an essential requirement for the trainee barrister and this training is given by judges/senior barristers of each of the Inns. The winning CEEMC team members are invited to visit the Inner Temple during their visit to the Supreme Court in London. A senior member of the Inner Temple joins AG Eleanor Sharpston as a member of the CEEMC judicial panel. Regular CEEMC judges are also members of the Inn, Prof Rosa Greaves and Carsten Zatschler and guest judges include; Lord Justice Laws in 2013, Sir Konrad Schiemann in 2014 and Kieron Beale QC in 2016 and 2017.